The Swimmin’ Eagles split a pair with the Redmond Panthers tonight at the Hood River Aquatic Center. The girls came out ahead 130-34, while the boys lost a close one 73-84. 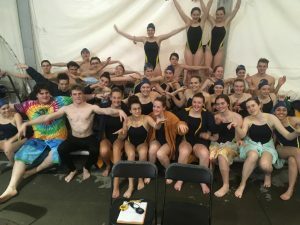 Nine swimmers took top honors – Sarah Arpag was a double winner in the 100 fly and 100 back, Celilo Brun took first in the 200 IM, Adam Burke won the 400 free, David Hecksel took the 200 IM and 100 back, Mario Jaimez Villa out touched the competition to win the 200 free, Chad Klass handily won the 50 free and 100 fly, Alea McCarty finished first in the 200 free and 400 free while co-captain Faith Ocheskey won the 50 and 100 free, and Luke Southall scored big in the 100 free. 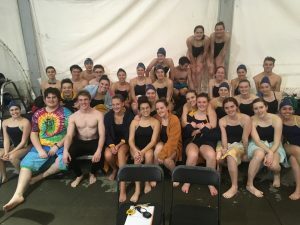 Finishing in second place was Celilo’s 100 breaststroke, Jessica Galvez in the 200 IM and 100 back, Madaket Greenleaf in the 100 fly, Mario in the 100 breaststroke, Olivia Sumerfield was 2nd in both the 200 free and 400 free while Lillie Tomlinson took 2nd place in both the 50 and 100 freestyle events. Rounding out the top 3 places were Adam n the 200 free, Madaket in the 200 free, Campbell Keller in both the 200 IM and 100 fly, Abby McCormack in the 100 breaststroke, and Luke in the 50 free. The girls dominated the 400 freestyle relay by taking 1-2-3 in that event, while the boys foursome of Chad Klaas, David Hecksel, Owen Summersett and Luke Southall placed 1st in both the 200 free and 400 free relays. Other relay wins included the 200 medley by Sarah, Celilo, Madaket and Faith – and the 200 free relay of Abby, Chloe Bullock, Alea and Lillie. The last home dual meet of the season is on January 31st at the Hood River Aquatic Center, followed by the District Swim Meet in Hood River February 8-9th.